Master watchmaker Heinrich Moser was also an enlightened man of business, an astute entrepreneur and an industrial pioneer. Using his entrepreneurial spirit, he further evolved the watchmaking craft that he had practised in Schaffhausen, his home town, putting in place a truly international service and importantly, a network of specialist retailers. A long-term partner of H. Moser & Cie., Bucherer shares many values with the company that has been called the "little pearl of Schaffhausen": Both are independent, Swiss companies, based in German-speaking Switzerland and were founded in the 19th century; in 1828 for H. Moser & Cie. and in 1888 for the celebrated retailer. 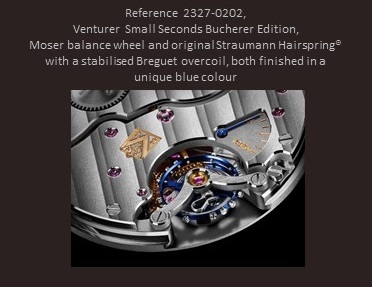 Today, H. Moser & Cie. pays tribute to Bucherer by creating the Venturer Small Seconds Bucherer Edition. The particular feature of this timepiece is the colour blue; presented on the all-new dial and also on the exclusive balance wheel and hairspring, created especially for this model. H. Moser & Cie. was created by Heinrich Moser in 1828. Based in Neuhausen am Rheinfall, it currently employs 50 people, has eight of its own calibres and produces 1,000 watches per annum. H. Moser & Cie. manufactures parts such as regulating organs and balance-springs, which are used for its own production as well as to supply its partner companies. H. Moser & Cie. is honoured to have a Moser family member with the company as honorary chairman of the board and president of the Heinrich and Henri Moser Foundation. The aim of the Moser Foundation, created by one of Heinrich Moser’s descendants, is to keep the family history alive and seek out antique pieces for the Moser Museum, located in Charlottenfels Manor, Heinrich Moser’s family home. MELB Holding is an independent family group, based in the heart of the legendary Vallée de Joux. With the aim of promoting watchmaking savoir-faire and proven expertise in the field, MELB Holding holds shares in the companies H. Moser & Cie. and Hautlence.